provides international recognition and is a benchmark for green spaces indicating that they are clean, safe and well managed – similar to the Blue Flag accreditation for beaches. It is the first time ever that a park in County Kerry has received this accreditation. A park is judged under several criteria: conservation and heritage, safety and security, cleanliness and maintenance, sustainability, community, and management. The Cathaoirleach of the Listowel Municipal District, Cllr Aoife Thornton, said: ‘This is wonderful news for Listowel. 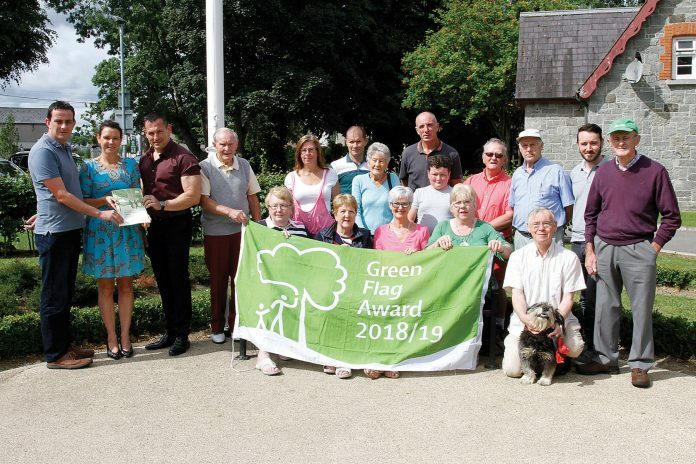 This award is due to the work of not only the Listowel Municipal District staff but also due to the efforts of the Listowel Tidy Towns Group and park users including the Listowel Community Centre, Listowel Pitch and Putt Club, Listowel Parkrun, Listowel RFC and Listowel Emmets GAA Club, and others, with the assistance of agencies including NEWKD who operate various community employment schemes and the local Gardaí who regularly patrol the area. ‘Kerry County Council engage on a local level to encourage use of the park, and provide essential services to help attract as many visitors as possible to the park and to ensure that they have a positive open green space experience. As a result, Childers Park and Woodlands is now an integral part of Listowel town and indeed is a focal point for recreation, activity and sports in north Kerry,’ she said. ‘This amenity has provided a place of enjoyment and happy memories for generations of townspeople. It has continuously developed since with the addition of the many amenities now located within it and will continue to be sensitively developed by Kerry County Council for the enjoyment of the people of Listowel and north Kerry. This award is recognition of the hard work of many people since its opening in May 1975,’ she added. The Advertiser is a free magazine distributed throughout the greater North Kerry area and parts of West Limerick.